"When the summer heats come with their suffering they have meaning more terrible than words can tell. Come over here. Step carefully over this baby--it is a baby, spite of its rags and dirt--under these iron bridges called fire-escapes, but loaded down, despite the incessant watchfulness of the firemen, with broken household goods, with wash-tubs and barrels, over which no man could climb from a fire. This gap between dingy brick-walls is the yard. That strip of smoke-colored sky up there is the heaven of these people. Do you wonder the name does not attract them to the churches? That baby's parents live in the rear tenement here. She is at least as clean as the steps we are now climbing. There are plenty of houses with half a hundred such in. The tenement is much like the one in front we just left, only fouler, closer, darker--we will not say more cheerless. The word is a mockery. A hundred thousand people lived in rear tenements in New York last year." I read "How the Other Half Lives" in college and it is why I decided to major in history. 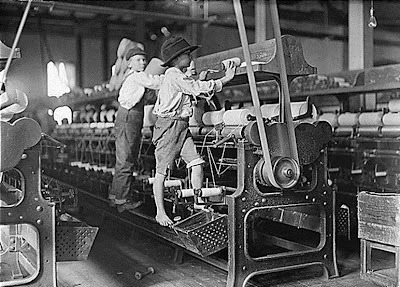 It is a photo journal documenting the lives of the poor, as they lived in the tenements and worked in the sweatshops of New York City at the turn of the century. It is a time in our history that we are not proud of. 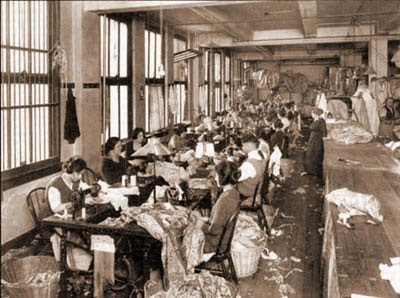 People lived in abject poverty in disgusting and unsafe conditions and worked their lives away in factories. The words and images that Jacob Riis planted in my brain have haunted me ever since. Every time I buy something that I know was probably made under unethical conditions a bell goes off in my head. I usually ignore it. I have even made jokes about it to my friends. "How can this possibly only cost $15?" 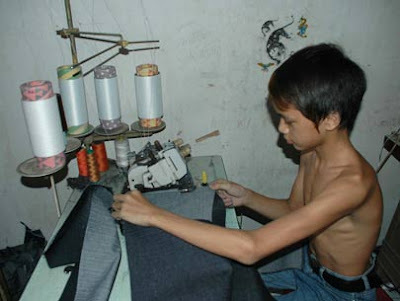 "It was probably made in a sweat shop in a 3rd world country by a 10 year old, that is why!" I may have thought about the small hands that made my precious garment once or twice post purchase. After a while it would just blend in with the sea of other items that I could not live without. After all, what were my options? "I don't make a ton of money and have two teenagers to feed so if I don't buy my clothes at Target how will I get by?" "I work so hard and I just want to look pretty, is that so much to ask? It's not like I spent $100 on it. It was only $15! Who cares that I also bought about 8 other items for $15, it was such a deal!" This is the conversation I have been having in my head for years. 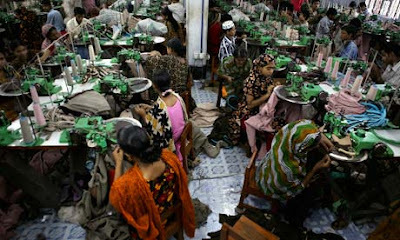 Until Rana Plaza. Now that I have the burn pile the obvious answer totally walloped me. "What if you had LESS clothing?" Today someone remarked after reading my earlier post, "Who has 75 lbs. of clothing?" Ouch. Yea, I do, because for some reason I didn't think I could get by without them. Because somewhere in the blur of television commercials, images and non-stop product endorsements I figured out that I constantly need new clothes in order to be awesome. And what American doesn't want to be awesome? It only took me about five minutes on Google to find the modern day versions of the photo's above. I have received a lot of feedback regarding this project in the last day or so. One argument I have heard is that we should allow 3rd world countries their opportunity to have their own Industrial Revolution. That we should just let them "work it out". Eventually they will start unions and begin the long fight for fair working conditions so we should "get out of their way" and let progress fight its own battle. I don't accept that argument. We are all on this planet together and it is time we stopped thinking in terms of "Us and Them". We have learned through the suffering of our own people that these conditions are unacceptable. We have the knowledge and understanding of how to make things better and yet we insists on getting cheap labor wherever we can get it so we can make more money. We the consumers insist on paying $10 for something we know full well was made by a 10 year old because it is "such a good deal" We read books like "How the Other Half Lives" in college and then sell them back to the bookstore without another thought. But huge corporations like Walmart, with billions of dollars of profit, refuse to be a part of the solution for their workers. Instead they focus on their bottom line and they treat these precious human beings like they are worthless. The cheaper they can get their clothes made the more profit and for what? They will never spend all that money in their lifetime, why not send a few million to the victims at Rana Plaza? So far only two Western brands have committed to helping the victims. "We are fully aware of our responsibility. We urge these other retailers to come forward and offer assistance," said the retailer." Primark has committed to provide "long term aid" to the children whose parents died in the collapse. Canadian retailer Loblaw has also acknowledged that it sold clothing made at Rana Plaza and has committed to helping the victims. “Our priorities are helping the victims and their families, and driving change to help prevent similar incidents in the future." I am encouraged to read this but it is just a drop in the bucket of the sort of aid these families will need to repair their lives. And what about the 1000+ confirmed dead? Nothing will ever bring those people back to life. Most of them were young women. They had been evacuated from the building the day before because cracks were forming in the walls of the building. But the next morning they were all ordered back to work with threats of losing their jobs if they failed to show up. These people were forced back to work in that building. In my mind this was nothing more than a forced extermination. And what about retailers in the good ole USA? 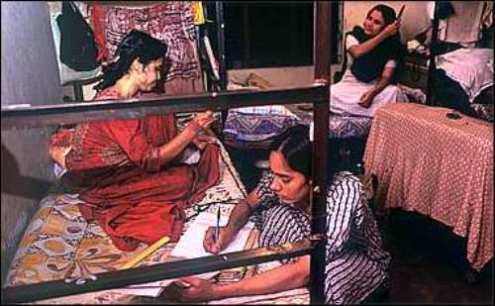 Many have issued statements that although they have sold clothing made in Rana Plaza in the past, they were not currently making anything for them during the collapse. The Children's Place and Walmart and many others have tried to deflect blame. 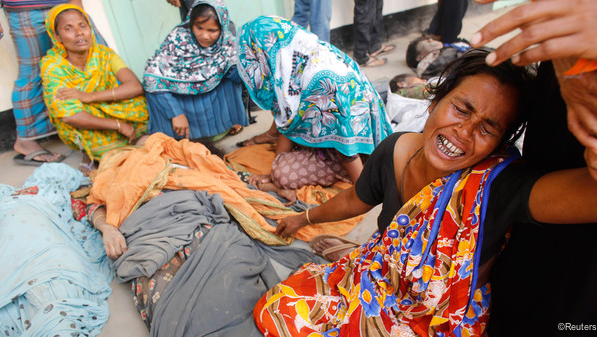 There is proof that the clothing produced at Rana Plaza was made for New Wave Style, New Wave Bottoms and Ether Tex, who's leading buyers are Walmart, Benetton, Mango, Primark and The Children's Place. I am confident more American brands will be named. I hope they know that the whole world in watching and waiting for them to do the right thing.